A planet's climate is decided by its mass, its distance from the sun and the composition of its atmosphere. Earth's atmosphere is 78% nitrogen, 21% oxygen, and 1% other gases. Carbon dioxide accounts for just 0.03 - 0.04%. Water vapor, varying in amount from 0 to 2%, carbon dioxide and some other minor gases present in the atmosphere absorb some of the thermal radiation leaving the surface and emit radiation from much higher and colder levels out to space. These active gases are known as greenhouse gases because they act as a partial blanket for the thermal radiation from the surface and enable it to be substantially warmer than it would otherwise be, analogous to the effect of a greenhouse. This blanketing is known as the natural greenhouse effect. Without the greenhouse gases, Earth's average temperature would be roughly -20°C. The atmosphere is a cloud of gas and suspended solids extending from the Earth's surface out many thousands of miles, becoming increasingly thinner with distance but always held by the Earth's gravitational pull. The atmosphere is made up of layers. it surrounds the Earth and holds the air we breathe; it protects us from outer space; and holds moisture (clouds), gases, and tiny particles. In short, the atmosphere is the protective bubble we live in. This protective bubble consists of several gases (listed in the table to the right) with the top four making up 99.998% of all gases. Of the dry composition of the atmosphere nitrogen, by far, is the most common. Nitrogen dilutes oxygen and prevents rapid burning at the Earth's surface. Living things need it to make proteins. Oxygen is used by all living things and is essential for respiration. It is also necessary for combustion or burning. Argon is used in light bulbs, in double-pane windows, and to preserve the original Declaration of Independence and the Constitution. Plants use carbon dioxide to make oxygen. Carbon dioxide also acts as a blanket that prevents the escape of heat into outer space. These percentages of atmospheric gases are for a completely dry atmosphere. The atmosphere is rarely, if ever, dry. Water vapor (water in a 'gas' state) is nearly always present up to about 4% of the total volume. In the Earth's desert regions (30°N/S) when dry winds are blowing, the water vapor contribution to the composition of the atmosphere will be near zero. Water vapor contribution climbs to near 3% on extremely hot/humid days. The upper limit, approaching 4%, is found in tropical climates. The table below shows the changes in atmospheric composition with the inclusion of different amounts of water vapor. The earth's atmosphere is a very thin layer wrapped around a very large planet. Two gases make up the bulk of the earth's atmosphere: nitrogen ( ), which comprises 78% of the atmosphere, and oxygen ( ), which accounts for 21%. Various trace gases make up the remainder. Based on temperature, the atmosphere is divided into four layers: the troposphere, stratosphere, mesosphere, and thermosphere. Energy is transferred between the earth's surface and the atmosphere via conduction, convection, and radiation. Ocean currents play a significant role in transferring this heat poleward. Major currents, such as the northward flowing Gulf Stream, transport tremendous amounts of heat poleward and contribute to the development of many types of weather phenomena. 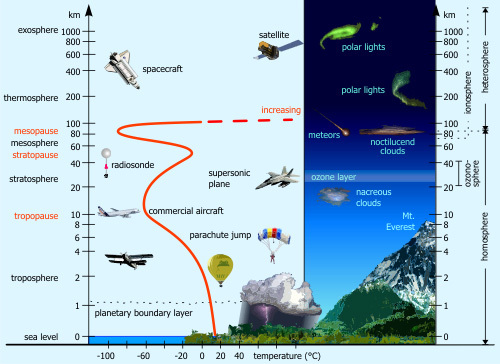 1) The troposphere is the first layer above the surface and contains 70 to 80 per cent of Earth's atmosphere. Weather occurs in this layer. The inhabitants of our planet live in the Troposphere. ( O2 ) and molecular Nitrogen ( N2 ). All weather is confined to this lower region and it contains 70 to 80 per cent of the Earth's atmosphere and 99% of the water vapor. The highest mountains are still within the troposphere and all of our normal day-to-day activities occur here. The high altitude jet stream is found near the tropopause at the the upper end of this region. The layer above this is the Stratosphere, this is where the Ozone Layer is formed. The atmosphere above 10 km is called the stratosphere. The gas is still dense enough that hot air balloons can ascend to altitudes of 15 - 20 km and Helium balloons to nearly 35 km, but the air thins rapidly and the gas composition changes slightly as the altitude increases. Within the stratosphere, incoming solar radiation at wavelengths below 240 nm. is able to break up (or dissociate) molecular Oxygen ( O2 ) into individual Oxygen atoms, each of which, in turn, may combine with an Oxygen molecule ( O2 ), to form ozone, a molecule of Oxygen consisting of three Oxygen atoms ( O3 ). This gas reaches a peak density of a few parts per million at an altitude of about 25 km (16 miles). The Ozone Layer absorbs ultra-violet radiation from the Sun. Without the Ozone Layer life as we know would cease to exist on our planet. Ozone is important because it is the only atmospheric gas which absorbs light in the B region of UVB rays. The Ozone layer extends from a height of 20 kilometers to 60 kilometers above the Earth's surface. The air is very thin at these altitudes. If all of the Ozone in the Earth's atmosphere were compressed into a single layer at the Earth's surface, it would only be 3 millimeters thick-basically two stacked pennies! The gas becomes increasingly rarefied at higher altitudes. At heights of 80 km (50 miles), the gas is so thin that free electrons can exist for short periods of time before they are captured by a nearby positive ion. The existence of charged particles at this altitude and above, signals the beginning of the ionosphere a region having the properties of a gas and of a plasma. An average temperature profile through the lower layers of the atmosphere. Height (in miles and kilometers) is indicated along each side. Temperatures in the thermosphere continue to climb, reaching as high as 2000°C. The troposphere begins at the Earth's surface and extends up to 4-12 miles (6-20 km) high. This is where we live. As the gases in this layer decrease with height, the air become thinner. Therefore, the temperature in the troposphere also decreases with height. As you climb higher, the temperature drops from about 62°F (17°C) to -60°F (-51°C). Almost all weather occurs in this region. The height of the troposphere varies from the equator to the poles. At the equator it is around 11-12 miles (18-20 km) high, at 50°N and 50°S, 5½ miles and at the poles just under four miles high. The transition boundary between the troposphere and the layer above is called the tropopause. Both the tropopause and the troposphere are known as the lower atmosphere. The Stratosphere extends from the tropopause up to 31 miles above the Earth's surface. This layer holds 19 percent of the atmosphere's gases and but very little water vapor. Temperature increases with height as radiation is increasingly absorbed by oxygen molecules which leads to the formation of Ozone. 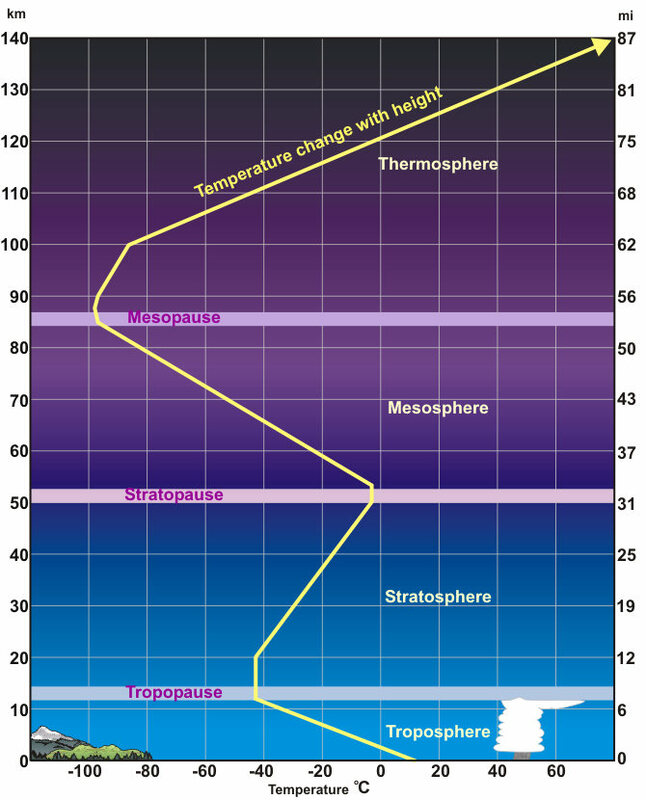 The temperature rises from an average -76°F (-60°C) at tropopause to a maximum of about 5°F (-15°C) at the stratopause due to this absorption of ultraviolet radiation. The increasing temperature also makes it a calm layer with movements of the gases slow. The regions of the stratosphere and the mesosphere, along with the stratopause and mesopause, are called the middle atmosphere by scientists. 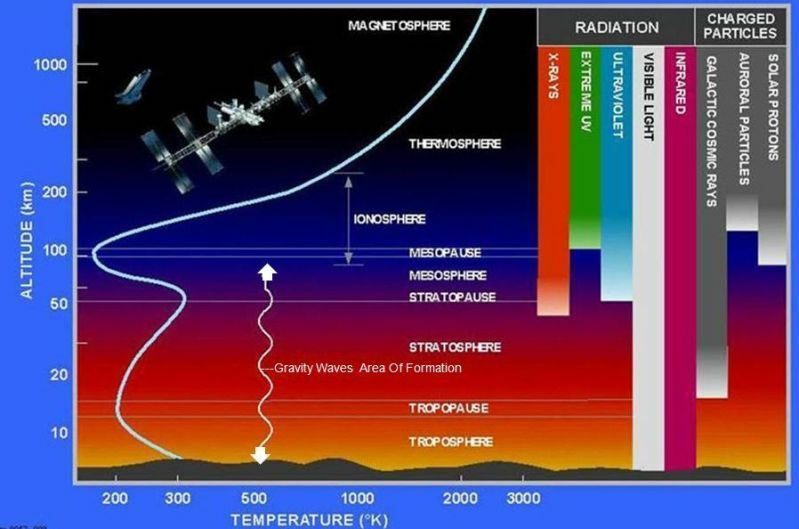 The transition boundary which separates the stratosphere from the mesosphere is called the stratopause. The mesosphere extends from the stratopause to about 53 miles (85 km) above the earth. The gases, including the oxygen molecules, continue to become thinner and thinner with height. As such, the effect of the warming by ultraviolet radiation also becomes less and less leading to a decrease in temperature with height. On average, temperature decreases from about 5°F (-15°C) to as low as -184°F (-120°C) at the mesopause. However, the gases in the mesosphere are thick enough to slow down meteorites hurtling into the atmosphere, where they burn up, leaving fiery trails in the night sky. The Thermosphere extends from the mesopause to 430 miles (690 km) above the earth. This layer is known as the upper atmosphere. The gases of the thermosphere are increasingly thinner than in the mesosphere. As such, only the higher energy ultraviolet and x-ray radiation from the sun is absorbed. But because of this absorption, the temperature increases with height and can reach as high as 3,600°F (2000°C) near the top of this layer. However, despite the high temperature, this layer of the atmosphere would still feel very cold to our skin because of the extremely thin air. The total amount of energy from the very few molecules in this layer is not sufficient enough to heat our skin. The Exosphere is the outermost layer of the atmosphere and extends from the thermopause to 6200 miles (10,000 km) above the earth. In this layer, atoms and molecules escape into space and satellites orbit the earth. The transition boundary which separates the exosphere from the thermosphere below it is called the thermopause.